As a food stylist I am always striving to make my recipes visually delectable. As a human being I endeavor to create healthy, nutritionally sound and delicious food. 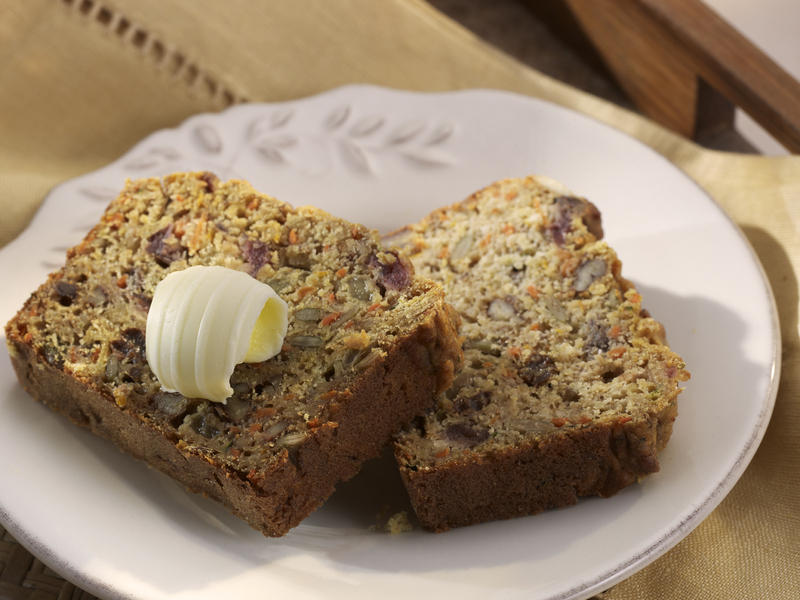 This past holiday season I created a loaded vege-fruit and nut loaf that went over really big with all who sampled its power packed deliciousness. My inspiration for the holiday loaf was from my childhood memory of a favorite breakfast fare, my mother’s zucchini nut bread accompanied by fruit salad and tea. Carrot cake has also always held a special place in my heart, so I melded the two with my own vision. I imagined a loaf that would encompass all of my favorite ingredients and be nutritionally sound, while moist and delicious. The result is a recipe that embodies a wide array of textures, colors, flavors, nutrients and fiber, with low sugar, and delights most everyone. I’ve shown it here with a butter curl, which is very elegant for special occasions, but it is great by itself or with a dollop of yogurt. Toasting slices enhances the mouth feel and flavors. Here is the recipe for your own enjoyment. Mix raisins, cranberries and juice together and let macerate for 60 minutes. Then drain and reserve liquid for Bellinis. Simmer multi grain cereal with water for 5 minutes. Set aside to let cool. Whisk wet ingredients together; eggs, oil, vanilla extract, agave, yogurt and citrus zest. Whisk dry ingredients together, except nuts but including ground almonds. Mix nuts into dried fruit. Mix shredded vegetables and apples together into raisin-nut mixture. Oil well, two 8”X 4” inch loaf pans. Spoon completed dough into oiled loaf pans. Bake for 50-60 minutes, or until knife comes out clean. Loosen sides with a knife and turn out onto a cooling rack to finish cooling. Slice with a serrated knife and serve alone or with yogurt, cream cheese or butter of choice. This is great for breakfast or anytime. Use the reserved fruit juice soaking liquid to add to champagne or seltzer for Bellini cocktails. I really love the book “Eat to Live” by Joel Fuhrman, M.D. He says it all in his quotient for Health in an American Society that addresses the obesity dilemma that underlines diabetes. His formula states that the ratio of nutients/calories is all we need to live a balanced and healthy life. I hope that this recipe will inspire you to enrich your life with bountiful flavor. My ulterior motive was to treat my boyfriend, who is diabetic, to new horizons, possibilities and choices in culinary options.